Summary: This creative and darkly humorous book describes the circumstances surrounding the deaths of 19 renowned people in history. It also explains, in many cases, what happened after their deaths. For example, Mozart was put into a body bag, doused in quicklime to decompose, and buried in an unmarked grave. After each chapter, there is an interesting fact sheet with information about the time period, the disease, etc. For Edgar Allen Poe, this included a description of tuberculosis (which his family suffered) and rabies (the disease which may have killed him). Critique: Despite the morbid subject matter, this book is highly entertaining. The author keeps it humorous and lighthearted seemingly to not depress the reader. 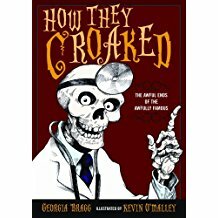 There are details included that one may have a hard time finding out for themselves; however, Bragg has a thorough source list in the back of the book so you can verify the information. I think older children would definitely enjoy this book because it's full of fun and interesting facts. More importantly, it is kind of gross and they will love to freak out their friends with what they learned. I enjoyed reading this book. I do agree that the older children would enjoy freaking out their friends with the things they learned in this book. Sometimes it takes the grossly humorous stuff to get some kids to read, however that's okay. I hadn't realized it won any awards so I was glad to see that. This book looks really interesting, so interesting in fact that I immediately got on my home library's web page, and put the item on hold. I don't particularly enjoy horror, but I've always been a bit fascinated by odd facts about deaths in the past. I really enjoy anything that has a historical setting.